Environmental biologists examine ecosystems with a focus on how living organisms interact with their environment. This program is relevant for today’s society which is facing complex environmental issues such as conservation and environmental contamination. You will study the basic science of environmental biology and ecological theory and learn about complex environmental issues facing our society. Areas of emphasis are biodiversity, conservation, ecological processes at the levels of genes to communities to landscapes, environmental contamination and other aspects of applied ecology. * These are elective courses. You will be able to choose from a variety of electives based on your interests. The Course and Program Catalogue has the complete and official listing of required classes and their descriptions for this program. An introduction to ecological principles and the functioning of aquatic and terrestrial ecosystems. Community structure and dynamics, ecosystem production, populations, energy flow and material recycling will be considered. Consists of modules taught by faculty in the environmental sciences. Students will participate together in weekly seminars, assigned readings, essays and oral presentations to learn about current issues in the environment and cutting-edge research with an environmental focus. An introduction to the theoretical and scientific foundation of conservation biology as applied to animals and plants. Course material will cover elements of population, community and landscape ecology as they apply to conservation challenges. Labs will include measuring biodiversity and analysis of current conservation issues. Field trips are compulsory. You will complete a community-based learning project with a nongovernment organization or another organization outside of campus in the capstone course. You will also gain practical experience in the lab or in the field. We are situated within walking distance of the beautiful South Saskatchewan River. You can take advantage of studying short-grass tundra, aspen parkland, boreal forest, taiga, tundra and aquatic environments by driving a short distance outside of Saskatoon. 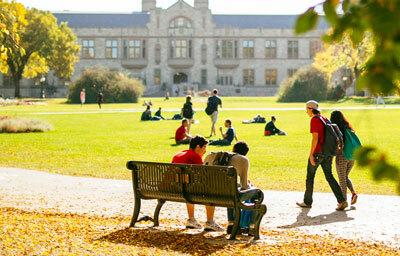 The University of Saskatchewan is one of the top research universities in the country and is home to a unique array of research infrastructure that our students are encouraged to use. These include the Canadian Light Source (Canada's national synchrotron research facility), the Toxicology Centre and one of the largest phytotron controlled plant growth facilities in the world. A weekly seminar series provides opportunities to hear prominent researchers from across North America and uSask speak about their work. The seminars feature a question and answer period for students. Tuition will vary depending on the type and number of classes you take in a year. This estimate reflects a typical amount you could expect to pay in your first year if you enroll in a full course load, the maximum number of courses allowed (2018-2019 Canadian dollar rates). Fees are used to fund specific student benefits, including health, vision and dental coverage, a bus pass, recreational programs and fitness centre access. The cost of books and supplies varies widely depending on the courses you choose. It is recommended that you budget between $1,000-$2,000 per year. You should consult with an academic advisor in the college when you begin your studies to decide if you want a four-year or honours degree. A non-refundable application fee of $90 CDN is required before your application will be processed. If you are looking for graduate level (Master or Ph.D.) programs please consult our graduate students' website. Do you want us to send you important reminders, information about our programs or notifications about uSask events?